Los Angeles area, join us this weekend - May 21-22. This year's show will feature five P-47s flying, and both A6M5 and A6M3 Zeros again. Our third year at the show, join Bruce Fenstermaker and I at the show. Stop by and say hello at our booth near the modern F-18 and A-10. Philadelphia area, June 3-5. The best east coast airshow! Join us at the Ghost Wings Magazine booth in the hanger. 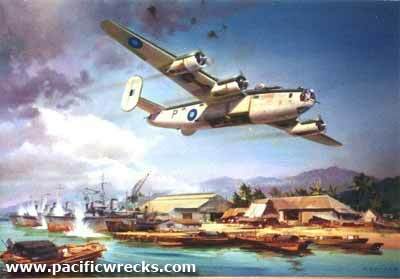 This is a large online project with contributors from all over the world and details losses from all countries - USA, Australia, Japan, New Zealand, Netherlands East Indies, Britain, China, and more... To date over 2000 aircraft losses are listed, with over 3500 individual personnel (pilots, crew members, passengers etc). The database has been set up for two reasons: Helping locate aircraft and crew members still missing from the Second World War in the Pacific, and inform relatives, friends and other researchers of the details of their servicemen's loss. The idea for this database came while studying for my Information Technology degree between 2000 and 2003. For those technically minded people, it is written in Microsoft's Active Server Pages (ASP) language, accessing a Microsoft Access Database. It will be setup on its own standalone server - which is currently being configured - and made available worldwide on a high-speed Internet connection. Users are able to search for losses either by aircraft (serial, unit, service, location etc) or crew member (name, service, service number etc). Each record will include all known information which has been obtained from numerous official, and unofficial sources. Photos of each aircraft, wreck, crew member, or related item will be displayed wherever possible. The system also has the ability of a reading room, where official records such as Courts of Inquiry or Missing Aircrew Reports would be available in Adobe Acrobat format. Such an enormous task requires help from numerous individuals and organizations. We are currently looking for people who could possibly help with information and details on aircraft losses; official documents such as Missing Aircrew Reports (MACRs); or even written support for such a project. All contributors will be recognized on the website. Of all the Pacific War battlefields, Iwo Jima has to be the most significant and at the same time-the hardest to get to. While it holds the same type of meaning to Americans as Gettysburg, Iwo Jima is not a place that you can hop in the car and make a road trip to. Iwo Jima is in the middle of nowhere and due to an agreement between the American and Japanese government, we and the Japanese can only return but once a year to visit and remember those who fought and died there some 60 years ago. 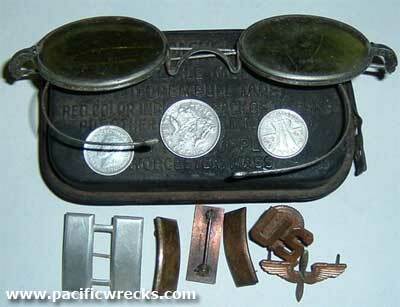 Dogtag, Sunglasses & Insignias - Returned to Family! A dogtag, sun glasses, and insignia of a US Army pilot named 'Hustad' were discovered by Henry Mayer, while combing the hills around Port Moresby. They appeared in his interview on PacificWrecks... thur an amazing turn of events, these tags were identified and returned to the family members in the United States. This story reveals the power of the Internet, readership of this website, and a lucky turn of fate for these small but significant pieces of history. While researching history about the RAAF 22 Squadron, Charles visited their former airfield at Vivigani, and the wreckage of several Beaufort bombers, and sites around the former RAAF and USAAF airfield complex. Little has ever been published in English about the Japanese base at Hansa Bay on the north coast of New Guinea. Dunn presents new research about the construction of the strip and its operations by the Japanese Army AIr Force. by Lamont Lindstrom & Geoffrey White.This book is illustrated with dozens of photographs from WWII, depicting Pacific Islanders. Drawing from a variety of collections in Australia, Japan and the United States the authors present a series of interesting photographers rarely, and in most cases never seen before by the average reader. Review by Daniel Leahy. Any researcher of the Second World War in the Pacific, particularly the war in New Guinea, would know the footage showing a blinded Australian militiaman being helped across a river by one of his mates. Often mistakenly listed as being filmed on the Kokoda Trail, the footage was actually shot in the Salamaua region by wartime cameraman Damien Parer.